Oxygen (O) (atomic number 8 and atomic weight 15.999) has density of 1.429 gm/litre at standard temperature and pressure. Melting point of oxygen is -218.79 deg C and boiling point is – 182.96 deg C. It is a colourless gas but the colour of liquid oxygen is pale blue. The phase diagram of the Fe-O binary system is at Fig 1. There is a very strong relationship between oxygen and steel. Oxygen is first used in the steel making process which is a controlled oxidation process. Excess oxygen going to steel during steel making process, if not properly taken care of, is source of many steel defects like porosity, inclusions etc. Oxygen is used in the processes of cutting, lancing, scarfing and welding of steels. Oxygen is also the cause of steel destruction by the processes of rusting, scaling and corrosion. Further transport of oxygen takes place in cylinders, tanks and pipelines made of steel. Oxygen is also used (oxy-fuel process) for heating of the steel. During steel making process, the main sources of oxygen in steel are as follows. Solubility of oxygen in liquid steel is 0.23 % at the steel making temperatures ( 1600 – 1700 deg C). However it decreases during cooling down and then drops sharply during solidification of steel reaching a level of 0.003 % in solid steel. Solubility of oxygen in steel has a relation with the carbon content of the steel. The carbon and oxygen content of molten steel reach an equilibrium that is specific to the steel’s temperature and the partial pressure of carbon mono oxide (CO). If the temperature of steel is constant, its oxygen content increases as the carbon content decreases. As the carbon level is lowered in liquid steel, the level of dissolved oxygen theoretically increases according to the relationship % C × % O = 0.0025. This means that, as an example, a steel with 0.1 % carbon, at equilibrium, contains around 0.025 %, or 250 ppm (parts per million), of dissolved oxygen. The level of dissolved oxygen in liquid steel must be lowered because oxygen reacts with carbon during solidification and forms CO which results into blowholes in the cast steel. 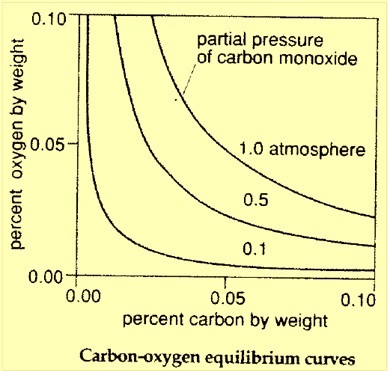 The equilibrium oxygen and carbon at different partial pressure of CO is shown in Fig 2. This figure shows that steel with low percent of carbon has a higher solubility of oxygen. Steel making is a process of controlled oxidation. It is the process of selective oxidation and removal of excessive carbon (C), phosphorus (P), silicon (Si) and manganese (Mn) from hot metal (liquid iron from blast furnace), scrap and other raw materials used in the steel making process. During the process of steel making, the main objective is to achieve the most complete and efficient removal of the impurities through oxidation, but the process is carried out in such a way that the resulting oxides are removed as much as possible by the time the heat is cast or teemed. In general, the role of oxygen during steel making is divided into two broad areas namely the oxidation process during steel refining for removal of impurities and deoxidation process for the efficient removal or control of residual oxides, once refining is completed. During the oxidation process, oxygen of high purity (99.5 %) produced in the cryogenic air separation plant is normally used. Iron ore, sinter, oxidized pellets are also used for the supply of oxygen during the process. Further since all the oxidation reactions are exothermic in nature, oxygen plays an important role in supplying the required heat to the process. Oxygen going in the steel during steel making is the source of blow holes and non metallic inclusions (oxides inclusions) which gets entrapped in the cast steel structure. Both blow holes and non metallic inclusions affect the quality of the steel. Hence deoxidation of liquid steel is an important technological process during steel making. Deoxidation of steel is a steel making technological operation, in which concentration (activity) of oxygen dissolved in liquid steel is reduced to a required level. There are three principal deoxidation methods namely deoxidation by metallic deoxidizers (ferro alloys, aluminum, calcium etc. ), deoxidation by vacuum, and diffusion deoxidation. The first two are the widely practiced processes in steel making for removal of oxygen. In oxygen cutting (also called oxy-flame cutting), a preheat flame is directed typically to the edge, or corner of the steel section to be cut. Once the steel becomes locally preheated to around 870 deg C or higher, it is blasted with a stream of high purity oxygen to make the cut. The oxygen readily reacts (or combusts) with the hot iron (Fe) to produce a stream of (primarily) molten FeO and this liquid metal is swept away by the flowing oxygen. The Fe combusts approximately as per the following reaction. This reaction releases a relatively large amount of heat. The enthalpy from this reaction heats and makes the products of combustion (FeO) liquid so that it can flow away from the cut surface under the action of the blowing oxygen, and it heats the surrounding material so that the cut can be continued (propagated). Iron oxide in the liquid state in actuality has an indefinite stoichiometry which can vary depending on temperature (and probably pressure). 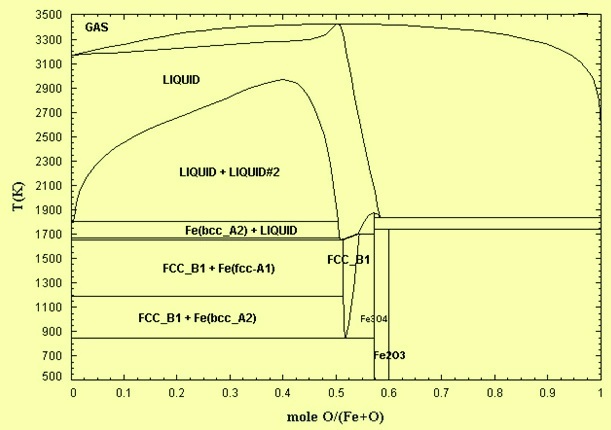 This liquid iron oxide as FexO where x typically ranges between 0.95 – 1.0 under normal conditions. Oxygen lancing is a cutting process which uses oxygen supplied through a consumable steel pipe to pierce holes in or cut the thick steel work pieces. The lance is lighted and steadily consumed. It involves a number of steel wires packed into the steel tube. The process is based on the principle that the iron pipe burns at approximately 1200 deg C to 2700 deg C dependant on the burning iron-to-oxygen ratio. A fuel gas is not required for the process itself, it may, however, be used in a welding torch to heat the cutting end of the lance to ignition temperature. The most important factor for process economy is a proper oxygen-to-lance material ratio, and this steel-to-oxygen factor shall not be below 0.5. Maximum piercing results, at minimum lance consumption, lowest oxygen consumption, and longest burning duration, can be expected at a sectional area ratio for tube to wire to oxygen of 1.2 : 1 : 0.7. In oxy-fuel welding, a welding torch is used to weld steels. Welding of steel takes place when two pieces of steels to be welded are heated by an oxy – fuel flame to a temperature that produces a shared pool of liquid steel. The liquid pool is generally supplied with additional steel called filler material. The detrimental effect of oxygen on weld metal properties (in the form of weld metal oxide inclusions) is well known. Properties such as weld metal plasticity and toughness are severely affected. Scarfing is the process by which the flaws and impurities developed on the surface of the steel work piece is removed by thermo-chemically melting and scalping the defective surface by oxy -fuel flame to hold a high quality in steel material. This processing is called hot scarfing in case the material of work piece is hot or cold scarfing in case the material of work piece is cold usually at the ambient temperature. Scale is formed on the steel surface during reheating and hot working of steel. The process of scale formation is a high temperature oxidation process which takes place when the surface of steel is exposed to the oxidizing atmosphere at temperatures which are above 570 deg C. Fe in the steel surface reacts with the oxygen present in the atmosphere to form oxides of iron. Scale is a multilayer material normally consisting of three oxides of iron namely wustite (FeO), magnetite (Fe3O4), and hematite (Fe2O3). Wustite layer is next to the steel surface and hematite is in the outermost layer. Rusting is oxidation process because it involves iron gaining oxygen (Fe conversion to Fe2O3) or iron atoms losing electrons. Both oxygen and water are necessary for rusting because together they can be reduced to form hydroxide ions. Rust is hydrated iron oxide formed by the following equation. The corrosion of steel is an electrochemical process that requires the simultaneous presence of moisture and oxygen. The rate at which the corrosion process progresses depends on a number of factors, but principally on the ‘micro-climate’ immediately surrounding the steel. The most common form of corrosion in case of steel occurs when steel comes in contact with an aqueous environment and rusts. When steel is exposed to a corrosive solution (the electrolyte), the metal atoms at the anode site lose electrons, and these electrons are then absorbed by other metal atoms at the cathode site. The cathode, in contact with the anode via the electrolyte, conducts this exchange in an attempt to balance their positive and negative charges. Positively charged ions are released into the electrolyte capable of bonding with other groups of atoms that are negatively charged. This anodic reaction for steel is as follows. After the metal atoms at the anode site release electrons, the common cathode reactions involving oxygen in case of steels are as follows. Oxygen is destructive at concentrations as low as 5 ppb (parts per billion). The presence of oxygen magnifies the corrosive effects of the acid gases (H2S and CO2). The inhibition of corrosion promoted by oxygen is difficult to achieve and is not practical in many cases. The forms of corrosion associated with oxygen are mainly uniform corrosion and pitting-type corrosion. 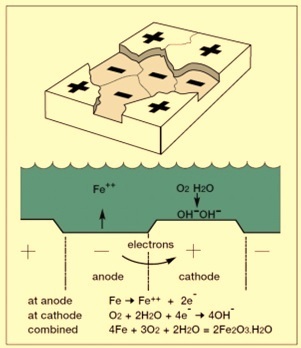 Figure 3 shows the diagrammatic representation of oxygen corrosion.